Our Plumber Theme for WordPress - it's minimal, clean, simple, lightweight and responsive. We think plumbers deserve better than the leaky, messyÂ plumbing websites out there. So we got out our toolbox and made a Plumber Theme that is watertight. The engaging front page tells customers about the businessÂ andÂ the services on offer. PlumbersÂ can show off projects they’veÂ worked on too.Â Further downÂ there’sÂ a location map and contact details. The theme is brimmingÂ with engaging imagery that can be used for free. And of course it’s easy to set up with our clearÂ documentation. This theme is licensed under the GPL 2 or any later version. Bundled components may use a different GPL 2-compatible free software license. Please also respect the licenses of any third-party components you plan to use with our themes. 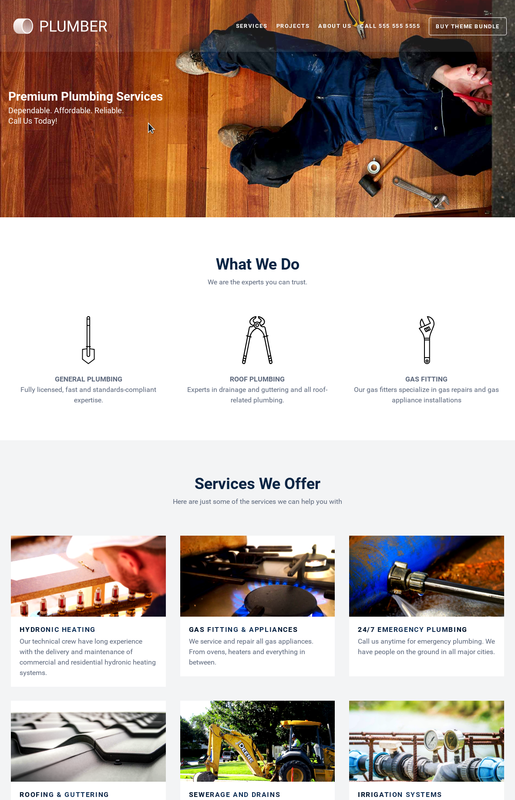 SitePoint PlumberÂ Theme uses a minimal, elegant layout designed to showcase your plumbingÂ company and the work you do. Your customers will be using different devices to access your web site – so it must adapt and be responsive to mobile. Our PlumberÂ Theme inherits our Base Themeâ€™s heavily tested responsiveness and flexibility. We have incorporated 50 beautiful, linear industry icons â€“ designed by CreativeNerds.co.uk â€“ and made it super easy for you to include the icons you need. We hired top-tier pro photographers to capture distinctive, original photos that you wonâ€™t see anywhere else. We also added a bunch of carefully curated, licence-free stock images for your use. Letâ€™s face it. Not every user uploads great photographs. We canâ€™t make a bad photo good, but we can give all your gallery photos a sharp, consistent look using CSSgram filters. Your original photos always remain untouched. Youâ€™re in the building industry, right? Watch as your service icons construct themselves before your eyes. Lots of icons to choose from. The SitePoint PlumberÂ Theme is powered by SitePoint Base Theme, which is a foundational theme we developed with a huge priority on page speed, mobile responsiveness, and high quality code. Our PlumberÂ Theme inherited ALL of its â€˜goodnessâ€™ from the get-go from SitePoint Base Theme. Easy translations with WPML plugin support. Fast and flexible small screen layouts. Perform basic styling right from the Dashboard.